WENTZVILLE, Mo. — Laura Hermann was excited to hear the news this past week. She was finally going to be able to wrestle other girls. "I wrestled at 126 (pounds), and a lot of times they had a lot more muscle than me," Laura laughed. 'They' had more muscle, because last year Laura, a sophomore at Wentzville-Holt High School, was wrestling males. Even though the state had more than 100 schools with female wrestlers last year, Missouri has never had a state-sanctioned tournament for high school girls ... until now. MSHSAA passed a newly amended by-law allowing to separate wrestling into two sports: a division for boys and one for girls. Changes will affect the upcoming season this winter. "I think to a lot of girls, a lot of them didn't realize they could [wrestle] until recently," said Laura. Laura's coach, Jason Moore, was proud of what she accomplished in her first year on the mat. "Laura is great. 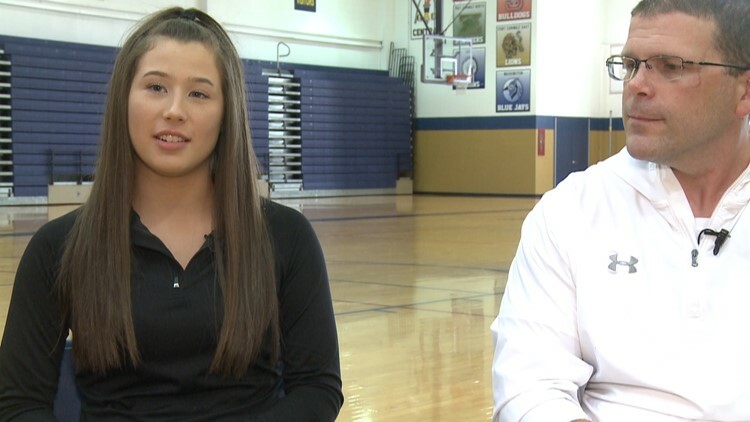 She did a great job this year," said Moore, head wrestling coach at Holt. "She worked hard. And it's a different kind of pressure when you're a female competing against males and practicing against males." The new measure allowing girls wrestling passed with a vote of 202 (for) to 41 (against). Moore is happy it did. "I"m excited about the opportunity that's going to go out to a lot of women. I love the sport of wrestling and I think it teaches a lot of lessons. I'm excited to have females take a more active role," he said. Laura called the change empowering. "A lot of people assume that it's a one gender sport and it's really not. It doesn't matter who you are really. I think you should try it," she said. Missouri is just the ninth state in the country to add high school girls wrestling as a sanctioned sport. Jason West, spokesperson for the Missouri State High School Activities Association said the topic of adding girls wrestling has been discussed within the wrestling advisory committee meeting for the last few years. There was enough momentum this year to finally bring the topic to a vote to member schools throughout the state. Sometimes making changes to existing things takes time and the wheels do not always move as fast as we would like them to move, but in this case the process involved a lot of information and fact gathering," said West.